Utterance in Motion | 9'00"
“Utterance in Motion” is inspired by the impact of grief and the process of overcoming it. The experience of loss is painful, but it can also be an enlightening and perhaps beautiful journey. Through the physical expressions of grief, the work explores the language of sorrow. This work was commissioned by the clarinetist Robert Spring and funded by Henri Selmer Paris and an HIDA Project Grant from Arizona State University. The work was premiered at Clarinet Fest in Ostened, Belgium in July 2018 by Spring. The accompanying video/animation was created by Claudia Rohrmoser and set design was done by Nicola Minssen. This work takes a close look at the relationship between the physical body of performers and their wind instruments. I am particularly interested in how sound is produced as an extension of human breath and is voiced through these instruments. Both conscious control and incidental and inadvertent breath allows the performer to affect the sound. Additionally, the size of the instrument is in direct relationship to the amount of air needed to power the instrument. These relationships are visually pronounced by using one of the largest against the smallest instrument in the modern recorder family. Shimmer, Tree | In Memoriam Jonathan Harvey | 15'00"
premiere: Constellation, Chicago, IL (May 7, 2014) Pianist. Breath in Quiet (2014) | 8'00"
Breath is a simple gesture. Made without consciousness, it contains subtle changes that can have tremendous meaning. This work is inspired by the conceit that subtle differences can be contained in the same gesture. Shifting in sonic color and rhythm, “Breath in Quiet” transforms throughout the duration of the composition. This piece was written for the cellist Russell Rolen from the Spektral Quartet. During my three-months residency at the Center for Art and Media (ZKM) in Karlsruhe, Germany in the winter of 2013, I conducted an intensive research into the electronic portion of this work. The work explores the relationship between timbre (water and a bell) and space in a virtual and spatialized listening environment: 24 speakers in a sound studio that allow individual and simultaneous positioning of sound in the space. The work imagines gentle drips of water and bells that eventually swirl in full force as to create a feeling of drowning. The texts for this work are taken directly from a web-blog I encountered during my residency. As I was reading an online article about the suicide case of Amanda Todd in British Columbia, I noticed a link to a suicide blog. It was no surprise that such blog exists. But the page I was directed to was a blog from an anonymous asking for suggestions for good locations and most effective ways for drowning oneself. To my surprise, several members had responded with disturbingly detailed descriptions in frank manner with notes of encouragements. When I returned to this site again one week later, the page was removed due to an explicit content as if it had never existed. I believe we can all relate to some extent about being lost at some point in our lives. Some lose the strength to fight to find the right answers. This work is about such tragic story. It is a story of lost, longing and hope, like the anonymous wandering in my mind in a form of a ghost searching for his soul. The texts for this work are lines and words taken directly from the blog in different orders. While Ripples Enlace... (2010) | 8'25"
commissioned by the Magdeburger Miskverein d.V. Inspired by the composer George Phillipp Telemann, this piece takes some of the materials from my favorite work by this composer: the "Hamburger Ebb' und Flut", also known as the "Water Music", which consists of dance suites that are each based on figures from Greek Mythology. The melancholic melodic lines of the 4th movement ("Der Verliebte Neptune") and the beautiful, longing underlying harmonic progressions and seamlessly flowing and light melodic lines of the Overture are used as the main foundations in my work. Throughout the work, materials from "Hamburger Ebb' und Flut" subtly come to surface as ripples of sound change form. Resonans campanis (2009) | 6'00"
This work was composed to commemorate the 500th Convocation in Rockefeller Chapel at The University of Chicago. The piece was written for and premiered by Tom Weisflog. Fixed (2005/rev. 06) | 10'30"
This piece focuses on the delicate sounds of key-clicks. The metallic timbral qualities of these sounds are enhanced by pressing the keys with a metallic surface. All computer-generated sounds in this work originate from the live flute sounds: they are recorded, manipulated, and played back in real-time by the computer. Piano Con Moto (2007) | Ca. 14'18"
“Piano Con Moto,” for piano, video, computer music, and three computers (live visual and audio processing), revisits a topic that captivated a generation of artists during 1910s and 1920s: the possibilities for synthesizing two divergent media into one artistic expression to create a new art form. Alexander Scriabin and Vladimir Baranoff-Rossiné used a type of piano capable of navigating between audio and visual realms: Scriabin imagining a “Tastiera per Luce”, a color piano, for the performance of his “Promethée”; Baranoff-Rossiné's “piano optophonique” projected light through painted and rotating glass plates, the colors and rhythms of which closely complemented the music. Arising from this context, a pianist, video artist, composer, and a video programmer collaborate to create a work involving a temporal-visual element, bringing a fused expression of two components. This five-movement work creates a fused expression of musical and visual components. 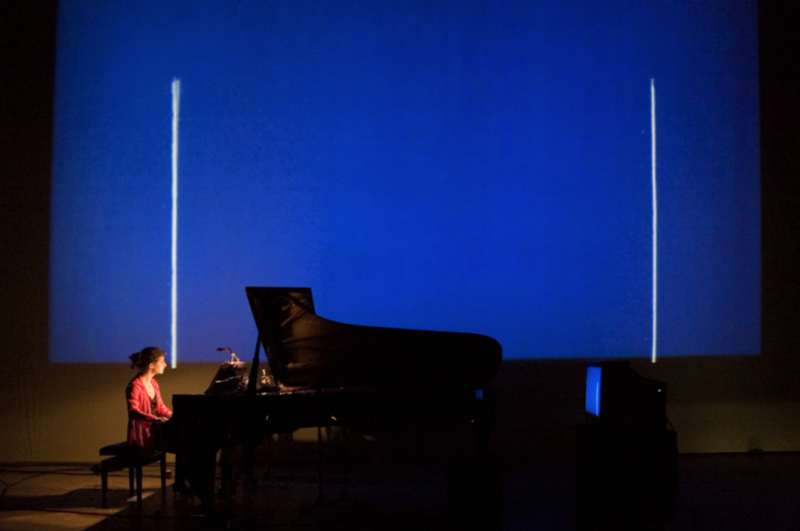 In this project, the pianist does not only manipulate both audio and visual elements during the performance, but is also asked to respond musically to these two components. The visual components are influenced by the sound parameters produced by the piano (amplitude, pitch/color, speed/rhythm, texture, etc.). Through the microphones placed near the piano, sounds are recorded, transmitted, and processed in real-time, and then simultaneously re-calculated and applied to various visual parameters (hue, color, speed/rhythm, saturation, brightness etc.). Within a given set of restrictions, the pianist is instructed to react to both the music she hears and the images she sees during the performance. Moving images thereby serve as a second kind of musical score. This work was written for Heather O’Donnell and was premiered at the Deutschland-Radio Ultraschall Festival in Berlin, Germany in January 2007. The work received funding from the Austrian Federal Chancellery, The Canada Council for the Arts and from DAAD-Berlin. This work was premiered at Ultraschall Festival (Berlin, Germany) by Heather O'Donnell. Little Suite (2006) | 3'00"
Little Suite" (2006) was written for the virtuosic flutist, Molly Barth, as a going away gift as she headed for her new and exciting journey from Chicago to the West Coast. This piece contains moments of grace, happiness, and strength. Hidden Voices (2003) | 9'20"
The work received numerous performances throughout Canada, Italy and Germany by the pianist, Everett Hopfner, as part of the Eckhardt-Gramatté National Music Competition Winner's Tour, which he received in 2013. Audio recording of this work is commercially available through Signpost Records by the pianist and conductor, Rei Hotoda. More information is available on the Publications' page. I imagine sounds that are visible, constantly transforming into different forms, sizes, and colors, as they travel through the air at different speeds. the timbre of the tape material is based on my personal characterization of the flute: metallic, sensitive, fragile, light, and warm, but at the same time cool. these sounds from the tape are sometimes as small and gentle as grains of sand, and other times, as unyielding as a mass of metal. the transformations of both tape and flute take place as their sounds react to one another. the tape material reacts especially to the air pressure of the flute, as if the air emerging from the instrument physically blows away and breaks the tape sounds into small particles. at the same time, the traveling force of the tape material through the air causes the flute to react back. 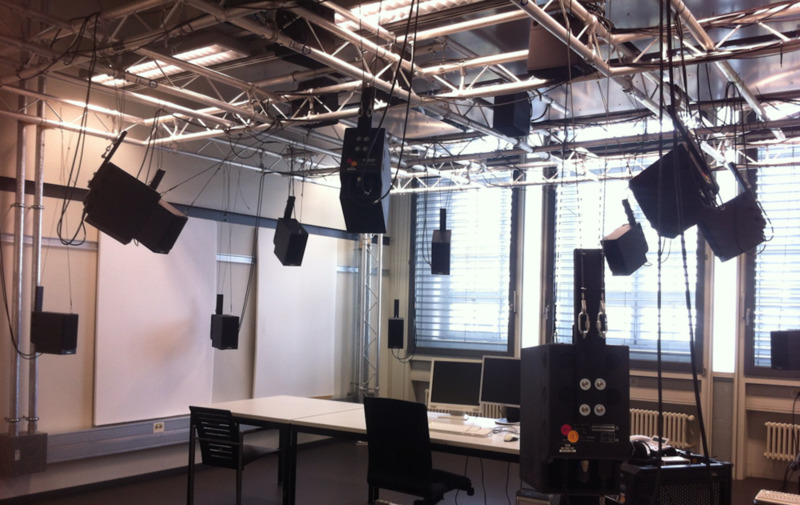 This work was realized at Technical University of Berlin Electronic Music Studio. The work received the Musica Nova Honor Prize 2002, and was selected as a finalist in the Russolo Electroacoustic Music Competition 2002. This piece conveys the relationship between two elements of sound: noise and pitch. These two elements are emphasized as separate voices by assigning each to an instrument: noise to tape and pitch to violin. Throughout this piece, the exchange and transformation of these elements can be heard. All computer-generated sounds are derived from the sounds of the violin used in this work. The violin sounds were manipulated and recorded for the music of the tape using CLM and Snd application programs. Audio recording of this work is commercially available through Amazon.com. The recording is performed and released by the violinist, Eric Rynes through Albany Records. More information is available on the Publications' page.